They are less expensive, per-pound, than always buying the breasts. The thighs, wings and bones make amazing soups. 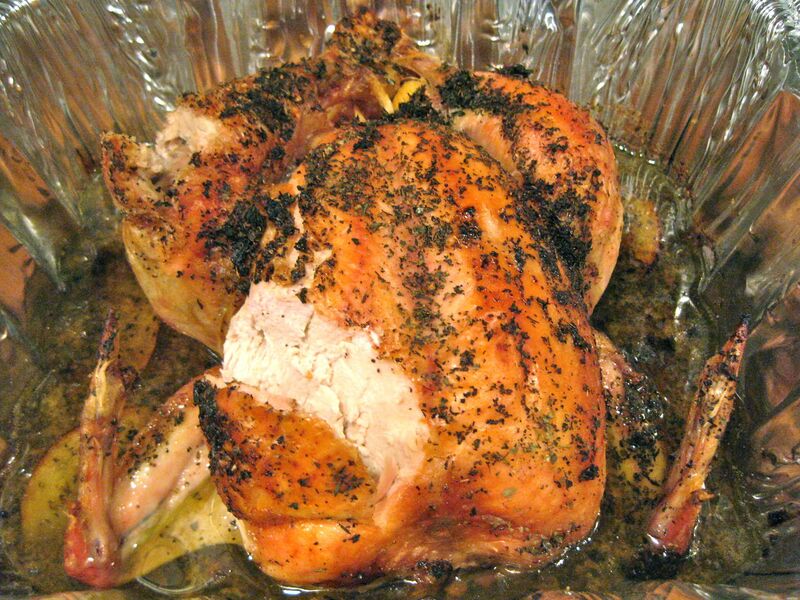 Rub a blend of your favorite spices and grapeseed or olive oil over your bird. Tie the drumsticks together and place in a roasting pan, breast-side up. Add a few cups of vegetable broth to the pan and add chunks of onions or carrot if desired. Roast at 450 degrees for 10-15 minutes. REDUCE HEAT to 350 degrees and continue to cook, basting a few times, for approximately 20 minutes per lb. OR until internal temp reaches 165 degrees. This is how we used to cook 50, 60 years ago. We never heard of preservatives to “embalm” our foods (and our living bodies). Most of the items for sale in a present-day supermarket, including our meats, are laced with chemicals, additives, and artificial flavors and preservatives — poor sustitutes for the real home-grown and home-prepared foods we think we are getting. One thing I do now that enhances the flavor for me is to slow-roast meat and poultry. Instead of 350 degrees for a shorter period, I will roast it at 180 – 200 degrees for twice the time — or longer. Pan must be tight-lidded, of course, to keep the juices in the meat. It’s a superior flavor and texture that results. Love your photos! They inspire me to return to my abandoned kitchen, and I have. This week alone I have made (1) chicken-rice-vegetable soup from frozen chicken stock, (2) macaroni shells with ground roundsteak, black olives, mushrooms and (prepared, forgive me) tomato sauce. Also (3) beef stew and (4) fresh mushrooms sauteed in butter. Heaven! I divvied it all up into mealsize portions and froze it. With my fresh organic spinach and grape tomatoes and fresh-shaved parmesan I can happily ride out the latest winter storm. The only whole bird I have ever cooked is Thanksgiving turkey. And it’s not really “fresh”. I don’t think I’d like messing with all the bones, even if they do make good soups.